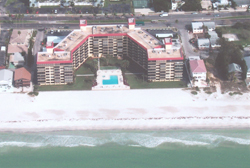 The Shore Mariner Condominium is located in the town of Redington Shores which is west of Tampa between Clearwater Beach and St. Petersburg Beach. 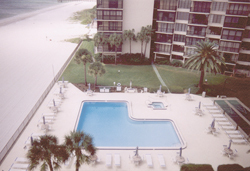 Shore Mariner is a direct Gulf Frontage condominium. All units face the beach with spectacular views. The immaculate courtyard and pool area provide another interesting view for most of the units. There is an exercise room, shuffleboard courts and a social/meeting room which includes a big screen TV, an informal lending library, tables and chairs, a kitchen and a pool table. 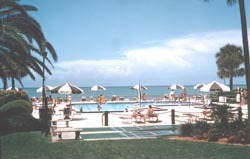 The buildings and property are well maintained with plenty of green space and a large heated pool and spa. The beach is wide with beautiful white sand. This is one of the finest and friendliest communities in the area. 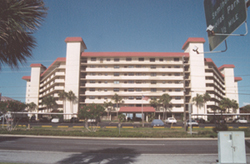 Shore Mariner is a Senior Living (over 55 years of age) residential community. The condos are mostly two bedrooms with two full baths and a full kitchen. Rentals are allowed; however, there is a ninety day minimum.